I get the chance to meet and interview amazing people, like pot star Tommy Chong, Congressman Dana Rohrabacher, quarterback Jim McMahon, billionaire Richard Branson, and the leading researchers and activists in the marijuana movement. But the interviews I find most special are those with the children battling life-threatening illnesses and conditions who find relief and cures from cannabis treatments. Imagine trying to comprehend the concept of your own mortality, finding a medicine that will save you, and then comprehending why the government would imprison your parents for giving it to you. Such is the case for 10-year-old Alexis Bortell. She suffers from a terrible form of epilepsy, but her father, Dean, has found that a combination of CBD oil and THC supplements relieve Alexis’ condition. A little girl who was slipping behind in school and spending afternoons with the school nurse is now almost a year seizure-free. But that’s only because Dean moved himself and Alexis out of Texas and into Colorado, where her medicine is legal. While Texas has passed a law allowing epileptic kids to use CBD oils, it mandates that the level of THC be exceptionally low to non-existent. Alexis’ condition doesn’t respond to CBD alone; she requires THC for it to be effective. In her keynote speech, she had two thousand attendees hanging on her every word. She was professional and rehearsed, an accomplished public speaker by any measure. She laid out her plans to bring whole plant medical marijuana to Texas, even if she has to become governor. You can learn more and support Alexis Bortell at TeamAlexis.org. You can find my entire coverage of the Southwest Cannabis Conference & Expo, including the Gridiron Cannabis Coalition panel of Jim McMahon, Ricky Williams, and Marvin Washington, the inspiring Montel Williams, and the numerous activists and entrepreneurs fighting for marijuana reform in the Lone Star State at my Soundcloud page. 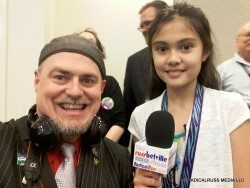 "Radical" Russ Belville is a blogger, podcaster, and host of The Russ Belville Show, a daily two-hour talk radio show focused on the evolution of the legal marijuana industry in the United States. The program is airing live at 3pm Pacific Time from Portland, Oregon, on CannabisRadio.com, with podcast available on iTunes and Stitcher Radio. Russ began his marijuana activism in 2005 with Oregon NORML, then in 2009 went on to work for National NORML, and found and direct Portland NORML.in 2015.